09 Oct, 2017 by	Margaret M.
Following in a “tradition for firefighters,” a new recruit introduced himself to his new coworkers with a gift. Second Battalion Chief Shawn McCarty explained that the tradition is voluntary, “not mandatory” and that new firefights come to the station “bearing gifts,” usually doughnuts, but you can bring anything you want. 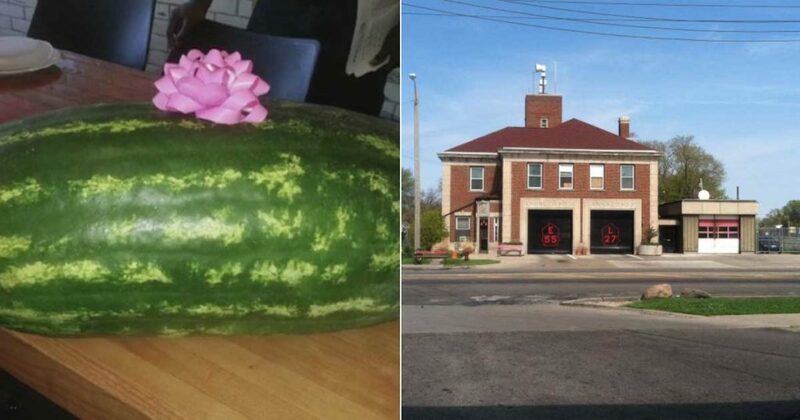 So, when probationary firefighter Robert Pattison, 41, went to introduce himself to the Engine 55 station in Detroit, he brought a watermelon as a gift. That’s fine, right? Instead of sugary donuts, bring some fresh fruit? But, Engine 55 was “instantly offended” because 90% of the people working there are black. And white Pattison is clearly trying to start a race war by bringing a tasty watermelon. Look, if you’re introducing yourself to a group of people you’ll be relying on for cooperation during life threatening situations, exactly nobody introduces themselves with the intention of outraging those people. Bringing a watermelon isn’t racist. It’s delicious. Pattison had just finished taking courses at the firefight training academy and brought the watermelon with a pink bow on top in what he called a gesture of “good will.” And all he got for his trouble was to be fired even before he started. When Chief McCarty was then asked whether Pattison should’ve “lost his job over a watermelon,” the Chief replied that he didn’t think so, but “between what he did and what was there are a few things that could have been done,” which is barely recognizable as a sentence let alone an explanation. A few years ago, a fruit basket sent from one high school band to another high school’s musicians was decried as “racist” for its contents. The gift was sent before the bands played for their high school’s varsity football teams and it contained watermelon, coconut, pineapple and watermelon gum along with other candy, given in a Halloween pumpkin bucket. Obviously the gift givers were nasty racists despite claiming they’d “never dreamed it would be considered racist” to send watermelon in a show of sportsmanship. The high schoolers apologized and were shocked that they were being accused of racism, with one mixed race student wondering out loud how “someone else could take offense” at the offering. The band was threatened with suspension for their actions.